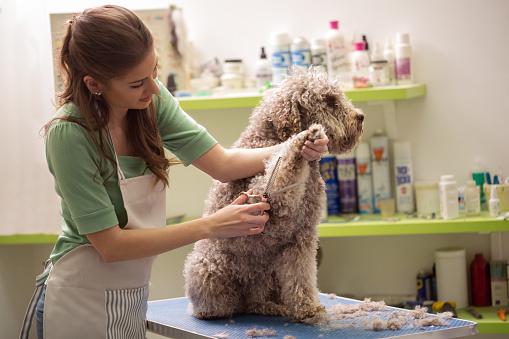 Many of us have dreamed of grooming our own dogs in order to save money and do it on our own schedule. Thankfully, you can find a pair of high-quality clippers that will work just as well as the ones the professionals use. First, you certainly don’t want to use your human hair clippers on your dog. Everyone dog owner has probably considered that at one point. Unfortunately, dog fur is very different from human hair. 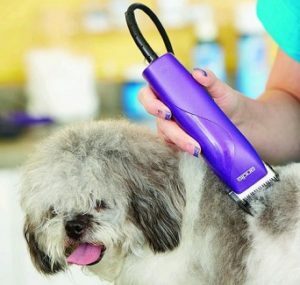 Dog clippers have been specially engineered to cut dog hair with minimal trouble. This reviews guide will show you what you need to look for in a pair of dog shears and then share our top picks. Finally, we’ll give you some clear instructions on grooming your dog. 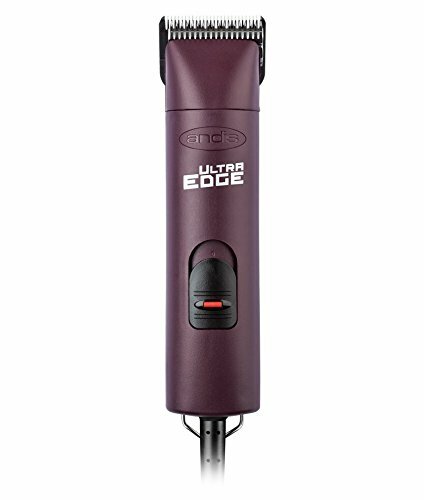 The ultimate guide’s best quality clipper is Andis UltraEdge Super 2-Speed Detachable Blade Clipper. They’ll cut through the hair on nearly any dog. You also have blades that can detach, so you can use any blade that fits. The Wahl Home Pet Lithium Ion Pro Series Pet Clipper is the best wireless clipper on our list. We really like the long battery life and you don’t have a cord that you have to worry about. 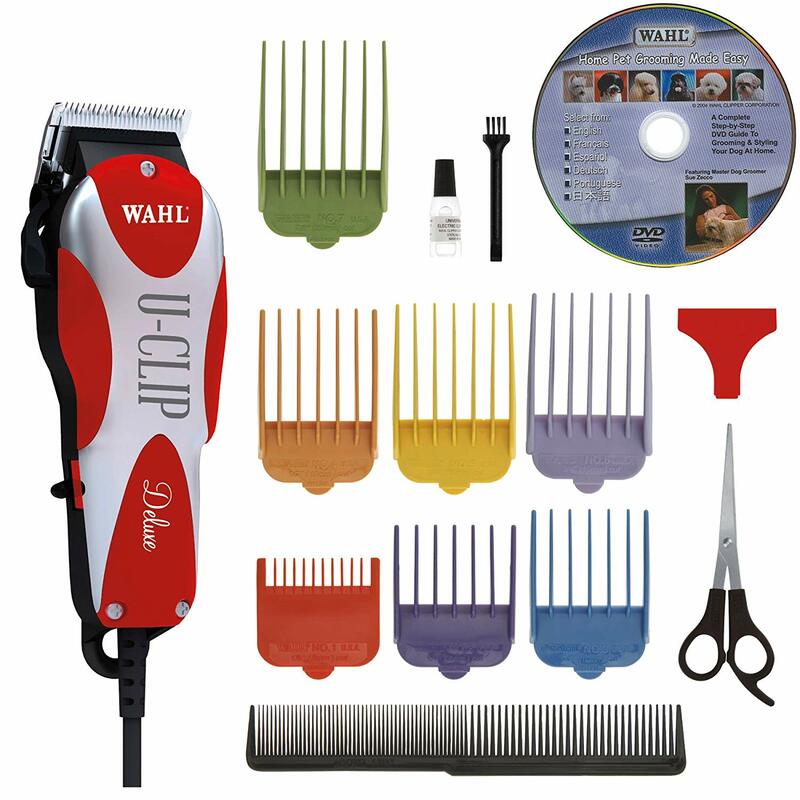 A good budget pick is the Wahl Professional Animal Deluxe U-Clip Pet Grooming Kit. 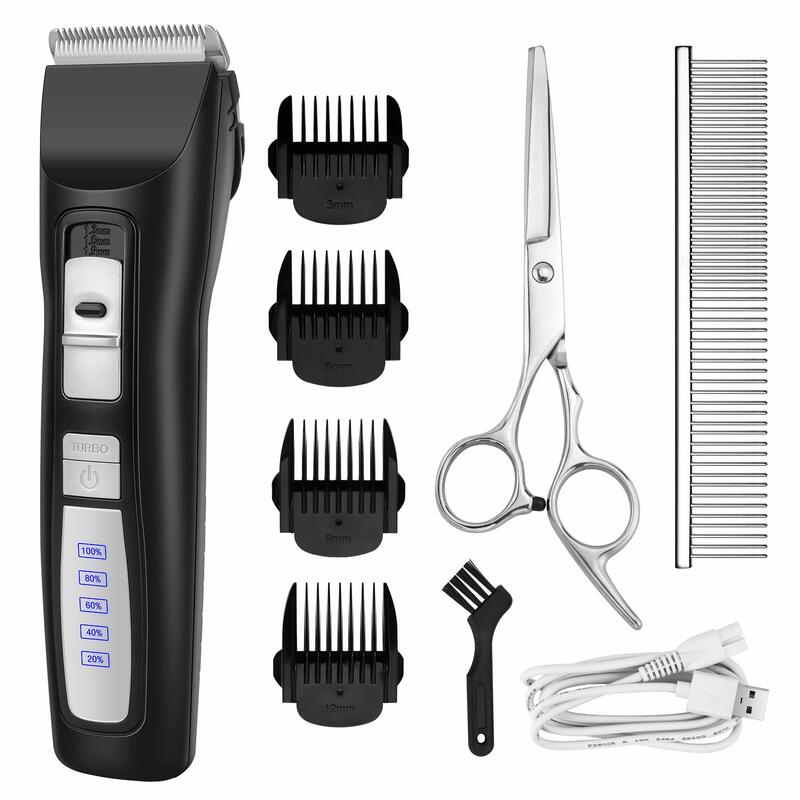 They’re a good quality pair of clippers at an even better price with an amazing kit for a beginner on a budget. A strong new one! We recommend Bousnic Dog Clippers 2-Speed Cordless Pet Hair Grooming Clippers Kit, it is a well priced rechargeable wireless clippers kit. If our recommended winners are good enough for you, check basic dog grooming guide in order to get necessary information on your dog grooming. Dog hair clippers are simple devices. There are many specifications you might not think about though. These small details often make the difference to make sure you have best clipping experience. The strokes per minute (SPM) is how we measure the clipper power. Higher power is not always better. If your dog has thicker coat it requires higher SPM, but a high SPM can often lead to overheating. This means you have to be careful when using a high SPM. Something with lower power is fine both for dogs with short hair, and thin also, but they do not work with on a thick coat. This is the main consideration for many owners. One speed clippers can last longer and provide hours of clippering sessions. Two speed clippers make sense if there two or more diffrent breeds at your home and need to adjust the speed. Just remember that it can be over-heated by high speed. Ergonomic handles work great if you have weak wrists, have to hold the clippers for long periods of time, or just want more comfort when clipping. This is usually a factor with big dogs or dogs with a lot of thick hair since they take a long time to clip. Some clippers have a ceramic blade. These are nice since they take longer not heated, and also acute for a long period of time. Steel works well too, but it does heat up much more quickly than ceramic. This is mostly depends on your preferences. Wired trimmers will not turn off when your almost finished clippering. Battery life has improved in recent years though, which means you can get two or three hours from fully charged wireless clippers. Plus, you don’t have to worry about tripping on a cord or your dog accidentally unplugging it. Noise does not really both most people. Some dogs absolutely hate the sound of clippers though. Quiet running clippers make make things easier for you pet, which makes things easier for you. This is especially true if your dog hates loud noises. As with most things in life, quality corresponds with price. Cheaper clippers don’t last as long and might have some more issues overheating since they’re usually steel clippers. Inexpensive clippers can still save you money and often work fine for smaller dogs with a thin coat. If you’re serious about getting the trimming done right, then the Andis ProClip is for you. They’re one of the best you’ll be able to find at any price point. They run quickly and efficiently to make quick work of even the toughest of coats. It’s extremely quiet and does not ordinarily overheat. This pair of clippers has been engineered from the ground up for professional groomers that use shears on a daily basis. The detachable blade allows for a wide variety of customization as well. They are a bit pricey, but they do live up to the price. This dog clipper is highly recommended by professionals and really stands out from the competition. Some of that competition includes other Andis clippers. If you want the best pair of dog shears you’ll be able to find, then you should strongly consider purchasing these. The only potential downside here is the price. Though it will pay for itself quickly because it’s cheaper than always going to the groomer and it’s much better for your wrist than a cheaper option. 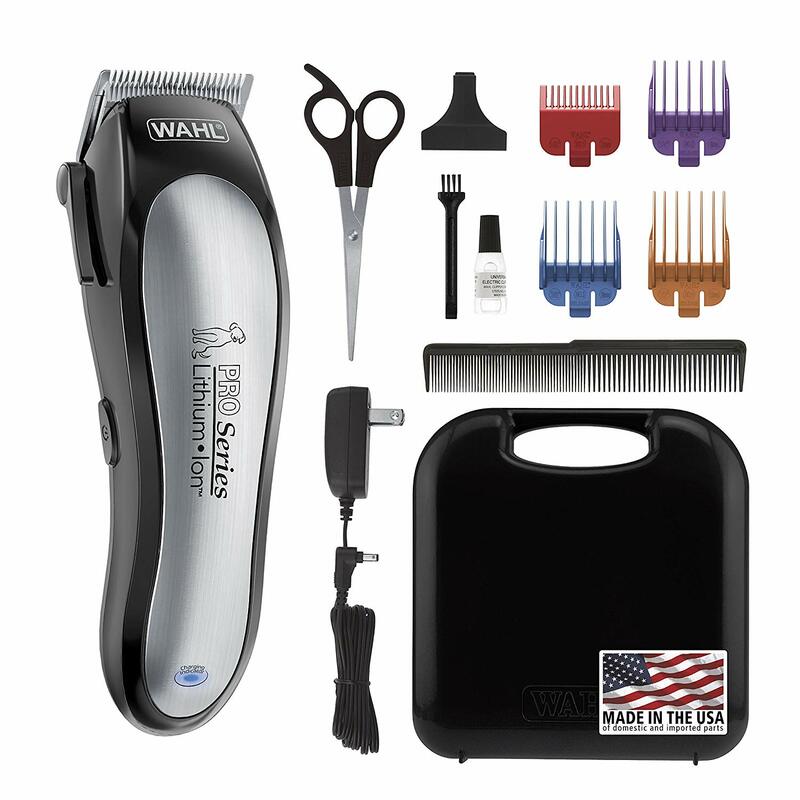 Wahl has you covered when it comes to excellent wireless clippers. These clippers can run up to two hours on one charge. That is more than enough battery life for even the largest dog. The battery only takes an charge too, so you can get back to cutting hair very quickly. The blades on this one are actually self-sharpening, so you don’t need to replace them as often. However, you do need to keep them oiled to get the full life expectancy from them. This clipper comes as a whole grooming set that includes everything you’ll need to keep your dog well-groomed and looking great. It comes with the comb guides that allow you to cut hair at different lengths. It also includes a regular comb and scissors to cut out thick mats and knots that clippers usually struggle to cut. They run quiet and come with everything you need to get started saving time and money on grooming trips right from your own home. No extra purchases are necessary either. Kit? Yes. 4 blade plastic blade combs, one pair of scissors, cleaning brush, small amount of oil, and a grooming comb. Bousnic Dog Clippers 2-Speed is a new cordless hair clipper, it is perfect for small, medium and large dogs, cats and other pets. It comes with a complete set of dog grooming kit, including 4 different lengths combs, a cleaning brush, scissors and a usb cable. There is a choice between two colors, either black or white. The one important thing about this clippers – extreme low noise. 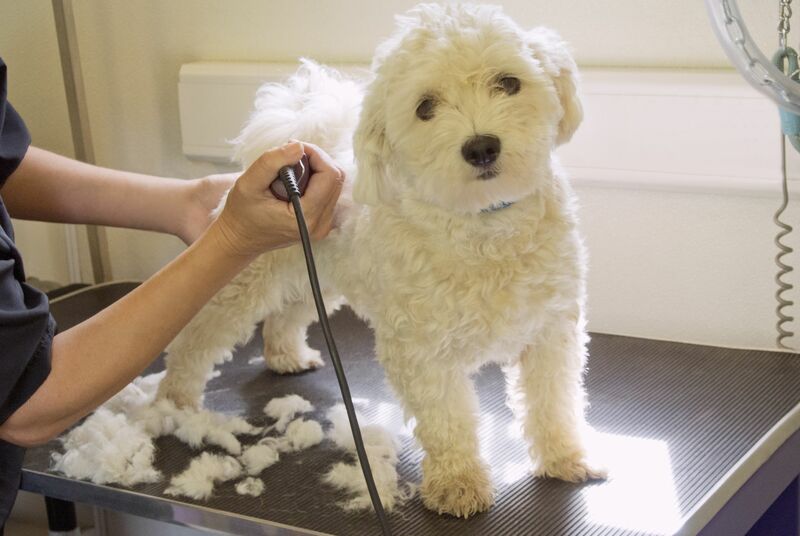 It is very important, because many dogs and pets get stressed hearing the sound and vibration during the grooming procedures. Bousnic have made their dog clippers very quiet, with much low vibration level, so your puppy won’t get scared. Bousnic Dog Clippers comes with a lifetime replacement guarantee, so if something happens with your grooming kit — they promise to provide a refund or a free replacement. Sounds like premium quality. So we had this option tested! Contacted Bousnic, and they were ready to replace our test clippers. This grooming set comes with a great pair of clippers at a budget price. You’ll receive everything you need to get started. This means you get comb guides, scissors, and a regular dog comb. Even better, you’ll also receive an apron and an instructional DVD on grooming. Quite the deal for a budget grooming kit. They run at an impressive 7,200 spm as well, but they’re not suited for thick coats due to their construction. The work fine medium thickness, which is good enough for most dogs. The clippers are also light – weighing 16oz. You shouldn’t have any difficulty holding them or maneuvering them around your dog. Wahl clippers also gives you a two-year limited warranty that covers any damage from the factory. This is a great way to see if you can handle dog grooming while not spending a whole lot of money. Don’t worry, you can always upgrade to a fancier set of clippers at a later date. Finally, we really like the extras that are included. It makes things very easy for a beginner. Kit? Yes. 7 guide combs, storage case, scissors, styling apron, styling comb, blade guard, instructional DVD. 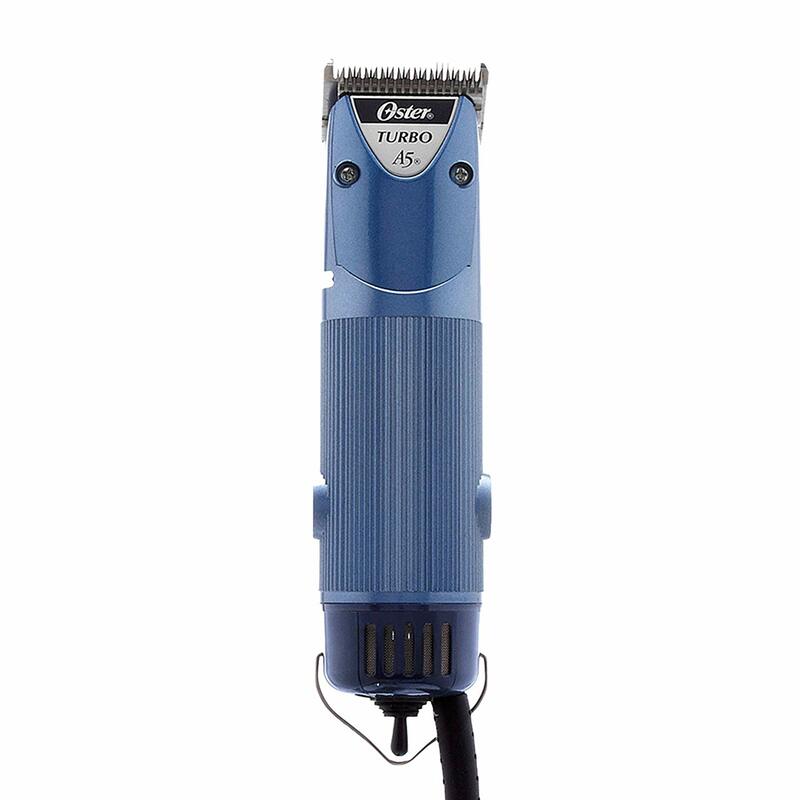 This two-speed clipper comes with a nice ergonomic grip and plenty of power. It runs at either 3000 SPM 4000 SPM. This makes it rather versatile and great if you dogs with different fur thickness. The grip also helps eliminate some of the discomfort from the extra weight from the two speed motor. The blade detaches easily, which allows you to replace it with a superior blade. This can help reduce overheating – one of the main complaints of this pair of clippers. Oster makes some good aftermarket blades. These blades really do help and they do not cost that much more money. You will also may consider to buy a couple of extra comb guides unless you plan on giving your dog a buzzcut. As for the sounds, it’s remarkably quiet running compared to other clippers. Making it super useful if you have skittish dog. All in all, the Oster Classic A2 is a great clipper base, but you will want to invest some money to make them truly great. The strength of this pair of dog grooming clippers is in its ease to customize them with different accessories. Unfortunately, those are not included, which makes the customization a weakness if you want an out-of-the-box solution. Oohlalapets team advise this for someone that likes to customize their clippers and understands they are not getting an out-of-the-box solution. Andis makes professional quality clippers. This puts them at a higher price point, but the quality makes it well worth it. They’re one of the preferred brands for professional groomers and it’s easy to see why. The first thing you’ll notice about these clippers is their toughness. They come with a shatterproof housing and they’re just built quite well straight from the factory. They run quiet and smoothly too. This will keep your dog relaxed during the trimming process. The ability to change the blades out easily is a nice touch as well. You can pick from a wide variety of different types to suit your needs. They’re compatible with all Andis and Oster A5 blades giving you a large amount of customization. You can also use them with any dog’s coat. You can even buzz down thick fur and matted fur. Matted fur, for those that don’t know, usually needs to be removed with a pair of scissors. 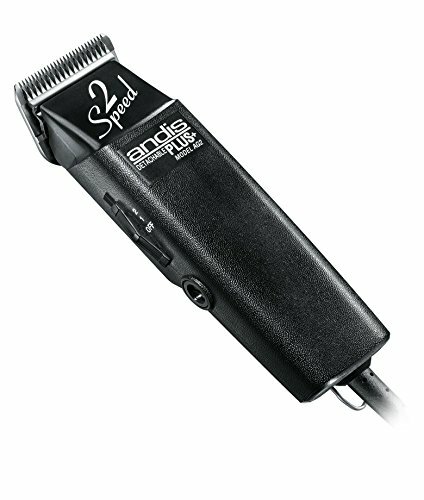 The Andis 2 speed is a awesome professional quality clipper. It’s best for those with a bigger budget or that have a dog with a thick coat of fur. If you’re entirely new to the art of grooming, then it can you probably think it’s difficult. We’ll give you a quick rundown of how to properly groom your dog. This way you can use your clipper straight out of the box. The first step is washing and combing your dog. Hopefully, your dog is acclimated to water and does not freak out. If they do freak out about water, then you can try giving them a snack to calm them down. You should also attach their leash to a sturdy pole to prevent them from running away and getting dirty. Once they’re wet you should brush out any matting or knots that they may have since these can catch the clippers and cause both of you some trouble. A specialized comb can really help if your dog has a lot of matted hair. You’ll probably want someone else around to restrain your dog during the process, so get a friend or family member to help. A small dog can be placed on a table that way you save your back. Just make sure your friend secures the dog if you place them on a table. Start shaving at the back of the neck. You’ll want to move slowly in order to get the smoothest cut possible. Using too much force or cutting too quickly can cause an uneven cut. Next, proceed down the body. Make sure you go with the grain in order to keep things looking as natural and as smooth as possible. You should then go to the back legs and then the front legs. When you get to the belly you should have your assistant stand the dog up that way you can easily reach it. You can go against the grain here and take off the plastic guard. Dogs tend to pickup a lot of dirt on their belly, so you want to keep the hair short. Your dog may move around a lot when you shave their stomach and when you get near his private parts. Keep that in mind. If the hair seems to come off slowly at any point, then you should use a brush to “back-brush” the hair. This raises it, which means the clippers can catch more hair. You might want to use a longer comb on the face since this area tends to be very sensitive. Finally, you need to cut some of the longer hairs off of your dog’s paws and possibly their face. Be careful not to cut the whiskers off. Your dog will get very stressed out and will not like you if you do that. As you can see, it’s a relatively simple process to explain. Unfortunately, some dogs are just very difficult to groom if they are not used to it. Do not worry, you can still groom your dog with enough practice. Treats also help to calm your dog down. There’s no better way to go groom your dog than doing it yourself with a high-quality pair of clippers. You get to choose the time and location, which is especially convenient if you work odd hours or live far away from a dog groomer. Even the most clippers pay for themselves after just a handful of grooming sessions. Plus, you’ll get to enjoy a unique bonding experience with your pet. Why wait? Get a set of trimmers and get grooming as soon as you can. It’s fun, sometimes easy, and a sure way to save time and money. Trusted Guides & Reviews of pet supplies and products. Proven products by real pet owners, who love their cats and dogs. We collect reviews and test all the pet products from food to crates and kennels, also everything in between. Our ultimate guides will help you to find the best products for your dogs and buy it. © Copyright 2019 - OohLaLaPets | All rights reserved.